In Starmometer’s 2nd Hot Picks for the ongoing 65th Miss Universe pageant, we picked the 6 ladies who all have the potential to penetrate the prestigious Top 12 and another 6 ladies who can pull a surprise this Monday during the coronation night (or day in Manila). No. 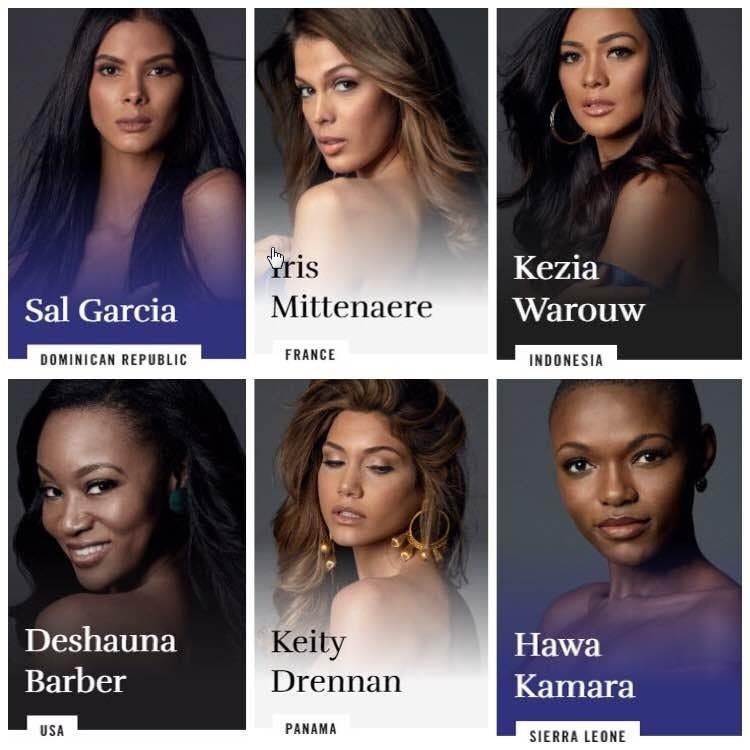 7: Miss Dominican Republic – This exotic beauty yet underrated Sal Garcia may not be in everyone’s list of favorites but she can change your mind once you see her at the preliminary competition. I think her walk is really really good. No. 8: Miss France – Iris Mittenaere is probably the strongest contestant from Europe. With a gorgeous face and perfect body (did you see her at the swimwear presentation? ), she has the potential to duplicate or surpass Flora Coquerel’s performance last 2015 and put France in the Top 6. No. 9: Miss Indonesia – Kezia Warouw is perhaps the best candidate that Indonesia has ever sent for Miss Universe. Her height and charisma are really working for her. She’s also got a strong fan base and could possibly win the fan vote. No. 10: Miss USA – Deshauna Barber is previously in our Top 5 but with last week’s events, I think she’s losing some steam. Although she did not make an impact during the Swimwear Presentation in Cebu, I still believe that she can deliver in the preliminary competition this Thursday. Needless to say, majority of the judges are Americans so it will definitely work in her favor. No. 11: Miss Panama – Just like Miss USA, Keitty Drenan also dropped in our rankings. She’s being overshadowed by fellow latinas like Misses Colombia, Brazil and Venezuela. She can’t be mediocre this Thursday or else she won’t make it in the Top 12. No. 12: Sierra Leone – Stage presence is the strongest quality of Hawa Kamara. From Africa, I have my eyes on her and Miss Kenya. No. 13: Miss Belgium – Stephanie Geldhof was under our radar until we saw her walked the ramp during the Swimwear Presentation in Cebu last week. We have a feeling that she will do well this Thursday at the preliminary competition. No. 14: Miss Kosovo – Camila Barraza is the only European contestant with the fierce latina vibe. Definitely among the strongest from this region. No. 15: Miss Ukraine – Just like Miss Belgium, Alena Spodynyuk was virtually unknown when the pageant started. But she got noticed during the Swimwear Presentation because of her stage presence. She’s now the no. 1 pick of Global Beauties. No. 16: Miss Mexico – In our first Hot Picks, Kristal Silva was in our Top 12. But she’s not making an impact in previous events that she’s now down to no. 16 in our list. Nevertheless, she has all the qualities that a Miss Universe should possess. No. 17: Miss Nicaragua – Missosology’s current no. 1 pick. No. 18: Miss Turkey – Tansu Cakir has a goddess vibe working for her. She only needs to improve her walk in order to get the judges’ attention because physically speaking, she’s got it! We will release our 3rd and final Hot Picks this weekend. This will reflect the contestants’ performance in the Swimsuit and Evening Gown competition this Thursday. Pia Wurtzbach is First Binibini to Wear a Filipino-Made Gown in Miss Universe and She Won! Will Rachel Peters Bring Home the Country’s 4th Miss Universe Crown?